This cozy, one-bedroom apartment is perfect for couples who wish to be close to the sunny Barceloneta beach and still only a short metro ride from all the main attractions of the city. Accommodating up to two people, this apartment is decorated in a modern style with parquet floors and a light color scheme. The living room has a comfortable leather sofa, a TV and DVD and access to the balcony through a set of large patio doors which allow plenty of light to enter the room. The dining table is situated in front of the up-to-date American style kitchen which is well-equipped with a cooker, microwave, kettle, toaster, pots, pans and cutlery (although there is no oven). The bedroom also has access to the balcony and contains a double bed with stylish linens. 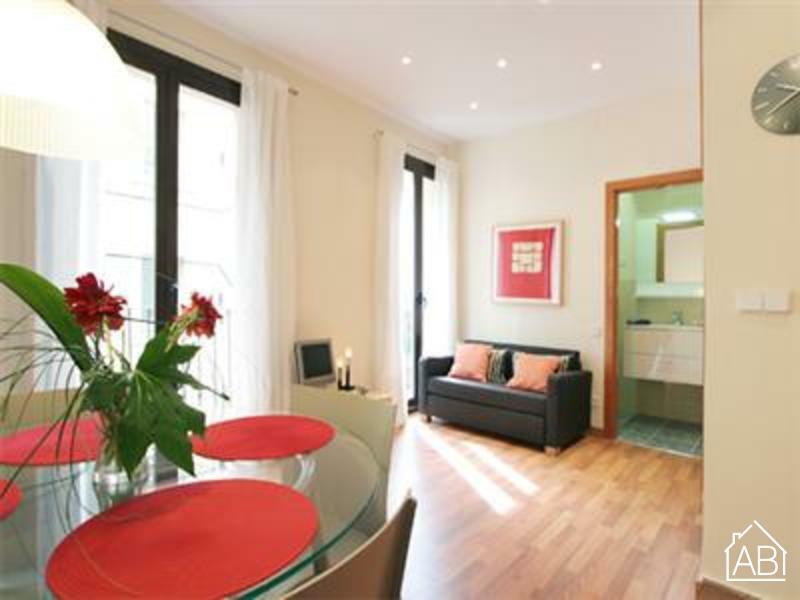 This comfortable apartment in Barcelona is a fantastic choice for your trip, and will make you feel like you are staying in a home-away-from-home.